Regular expressions are such a powerful tool for manipulating text and data that anyone who uses a computer can benefit from them. Composed of a mixture of symbols and text, regular expressions can be an outlet for creativity, for brilliant programming, and for the elegant solution. While a command of regular expressions is an invaluable skill, all there is to know about them fills a very large volume, and you don't always have time to thumb through hundreds of pages each time a question arises. The answer is the Regular Expression Pocket Reference. Concise and easy-to-use, this little book is the portable companion to Mastering Regular Expressions. O'Reilly's Pocket References have become a favorite among programmers everywhere. By providing a wealth of important details in a concise, well-organized format, these handy books deliver just what you need to complete the task at hand. 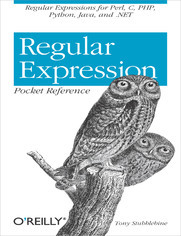 When you've reached a sticking point and need to get to a solution quickly, the new Regular Expression Pocket Reference is the book you'll want to have.